"I think endorphins make me happy." My foot situation, however, is not pleasing me. I took the liberty of taking a picture of my foot to properly portray my current toe status. On the left, is my "normal foot." 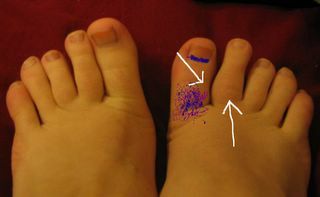 On the right, the white arrows are pointing to my swollen toe. The purple and blue marking illustrate where the initial bruising/swelling was. This whole situation is confusing. My foot was mysteriously injured over two weeks ago. Do you know what else is ridiculous? The fact that my left foot is an entire size large than my right foot. *Yes, I know my middle toes and my little toes are squished. Yes, I know my second toes are long and crooked. Yes, I know my toes are hairy. Well, listen, the rest of my body is pretty near perfection. I have to have some faults. Wanna fight about it? **Actually, I retract that statement. Andrew, due to his toenail problem, probably has the most malformed feet in history.